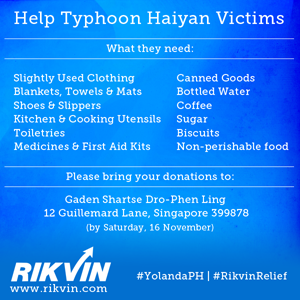 In support of Typhoon Yolanda (international name Haiyan) victims, Rikvin appeals to your kind hearts to reach out to the victims of the typhoon in the Philippines. Important: Please bring your goods to the GSDPL office by 16th November, Saturday, before 5pm. We sincerely apologize for the short lead time, but there is a sense of urgency to deliver the items to the devastated areas. The victims are in dire need of our help.